Director/Story – Takeshi Nozue, Screenplay – Takeshi Hasegawa, Producers – Shinji Hashimoto, Kosei Ito, Larry Sparks & Hajime Tabata, Music – John Graham, Main Theme – Yoko Shimomura, Animation Director – Hirotaka Sawada, Art Direction – Hiroto Ide, Kenji Niki & Yusuke Suzuki. Production Company – Square Enix. In the kingdom of Lucis, the king Regis has a magical crystal contained in a ring that maintains a forcefield that protects the kingdom from attack by enemies. Regis now receives an envoy from their enemy Nilfheim asking to make peace. The requirement of the peace deal will be that Lucis surrender all territories beyond the capital city Insomnia and that Regis’s daughter Lunafreya marry the emperor of Nilfheim’s son. Regis surprisingly agrees to these terms. 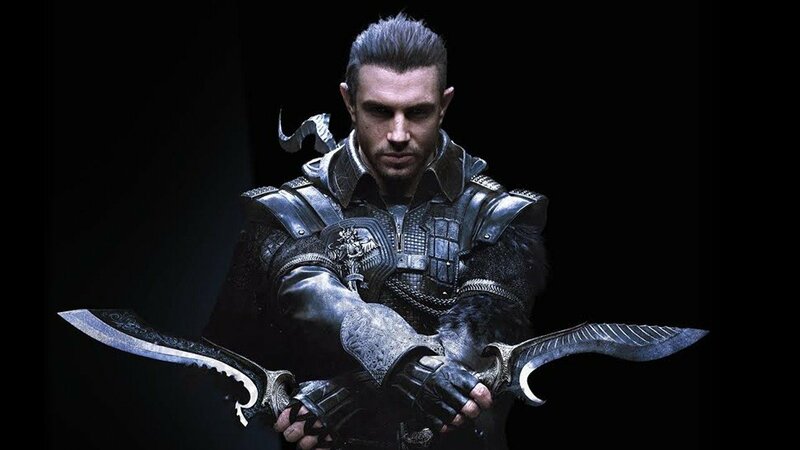 The king’s elite guard The Kingsglaive are not happy with this, especially when one of their number is killed while on a special mission to protect the princess. Nyx Ulric of the Kingsglaive realises that Lunafreya has been abducted and sets out to rescue her. In doing so, they discover that the peace treaty is only a trap to get Lucis to lower its defences so that Nilfheim forces can invade, intending to kill Regis and take the ring that controls the forcefield. Final Fantasy is a popular videogame series from the Japanese company Square (known as Square Enix following a 2002 merger). The original Final Fantasy (1987) was created by Hironobu Sakaguchi for Nintendo, he believing it would be his final game before he retired. Instead, the game was a success and spawned a huge franchise. There have been fifteen main games to date on various platforms as well as numerous spinoffs. Unlike other franchises that usually build onto the same world and characters, the Final Fantasy games are unrelated to one another in story and setting. The popularity of the franchise has seen two previous film spinoffs, both of them animated. The first of these was Final Fantasy: The Spirits Within (2001), directed by Hironobu Sakaguchi himself. This opted for a science-fiction story that was unrelated to any of the games. However, the film proved to be a massive flop at the international box-office, placing Square into receivership (and leading to its merger with Enix). A few years later, the studio again ventured into making a film with Final Fantasy VII: Advent Children (2005), directly taken from the game, although this was more modestly produced and only released to video/dvd. This third film Kingsglaive was released four months in advance of the premiere of the latest iteration Final Fantasy XV (2016), a massive multiplayer online game where the setting depicted in the film exists as an open gameworld. Even though they bear the same name, none of the Final Fantasy films follow each other in terms of continuity or setting. Moreover, the numbering they follow is confusing. It makes sense when you view them in terms of the games they are derived from but in terms of a film series, the numbering goes from Final Fantasy I (The Spirits Within) to Final Fantasy VI (Advent Children) to Final Fantasy XV here. For people coming to the series via the films and not the games (like me), it lends the natural question of where the other twelve films are meant to be. The Spirits Within was an amazing work in its time for opting for a highly detailed, photorealistic style of animation. It was a box-office failure and this is perhaps why Advent Children went back to the type of anime that we are familiar with – elongated androgynous males, exaggerated eyes, over-the-top fantasy costuming and weaponry. Kingsglaive, while still a fantasy film, returns to the same photorealistic style of anime we had in The Spirits Within. The results are breathtaking and dazzling in ways that Western animators don’t even seem to be aware. The characters, which have all been motion captured, come with a level of detail to them where each of the fashionably grizzled whiskers on the faces of the heroes seems to have been individually animated. Insomnia has a depth of detail that makes it look like a realistic cityscape. The action scenes are epically big – you are blown away by the sheer scale of the stormclouds and demonic forces in the battle during the opening scenes, and there are some genuinely amazing set-pieces including the mid-air rescue of the princess and the climactic action scenes. It is Japanese animators doing the things they do best – epic world-shaking action sequences, heroically tragic sacrifices. The only complaint in all of this might be the climactic scenes where (for reasons I am not clear about) giant stone figures around the city come to life to battle the demonic forces where it feels just a little tooooo much that Kingsglaive is trying to copy its action scenes from one of Michael Bay’s Transformers films. The one thing that kept bugging me throughout Kingsglaive is the setting. In the opening scenes, we have what is clearly a fantasy kingdom with the employment of magic and demonic forces. The timeline then jumps forward a number of years. Disorientingly, we seem to be in a contemporary setting where the city of Insomnia could be any part of Tokyo, while the cars and motorcycles all look contemporary (even one that seems to display the Audi symbol on its hood), there are newspapers and cable news channels, characters use cellphones and so on. Certainly, these intermingle with other elements that are clearly fantastical. The overall effect is baffling – magic and technology don’t really mix (unless you are opting for an urban fantasy setting), they both operate on separate underlying rationales and to have them competing (at least without the film giving us an explanation as to why) leaves you confused. The other question it leaves you with is why the film relied so much on a contemporary setting. It is something you are used to in works like tv’s Battlestar Galactica (2003-9) or Halo 4: Forward Unto Dawn (2012), which use contemporary vehicles, props and technology because it is cheaper than hand-crafting all of the technology from scratch (in so doing improbably suggesting futures where technology has either stagnated for several hundred years or even more implausibly other worlds have evolved in parallel to our own). But surely an animated film would have no such constrictions placed on it when animating a contemporary vehicle, a futuristic or alternate reality one, all of which would all involve no more work than the other (except perhaps the vehicle designer to exercise their imagination).